Hon. Ms. Sherry Ayittey who first conceived the idea of a Ghana Space Agency (Credits: Guangming Daily Overview). In 2009, Ghana’s Minister of Environment, Science, and Technology (MEST), the Hon. Ms. Sherry Ayittey, released an initial three-phase development plan for 2011-2015, establishing a Ghana Space Agency that will develop a national space program and coordinate existing space activities in the country. Matching policy with action, the Ministry formed an interim implementation steering committee to provide oversight of the overall plan’s implementation and to manage the strategies for operational development throughout those phases. Professor F.K. Allotey, an internationally respected mathematical physicist who is credited with establishing the “Allotey Formalism” based on his research on soft x-ray spectroscopy, chaired the Committee. Since inception, the Committee has implemented two of the Plan’s phases–establishment of the Ghana Space Science and Technology Center and its upgrade to Ghana Space Science and Technology Institute. The Institute will evolve into the Ghana Space Agency in 2016. Thereafter, and through the Agency’s leadership, the Ghanaian government will invest in space programs including the procurement of telecommunication and Earth observation satellites. In the Plan’s first phase, the Ghana Space Science and Technology Center was created in January 1, 2011 and placed under the Ghana Atomic Energy Commission’s Graduate School of Nuclear and Allied Sciences in Ghana’s capital city of Accra. The school, in collaboration with the University of Ghana, was tasked with facilitating development of the needed intellectual resources for the emerging space industry through its graduate degree programs in engineering, mathematics, and science. The Center’s strategic placement within the School’s existing organizational and administrative structure made easy its commencement. For example, the Center conducted an internal study on existing and needed institutional infrastructures that deliver or could be used to deliver training in space science and engineering. In addition, the study assessed the existing and needed human scientific and technical capacities necessary to support and nurture the nation’s emerging space sector. The study’s findings and recommendations paved a forward-looking project for the introduction of a graduate (and undergraduate) study program in astronomy and astrophysics. Another project was the training and reorienting of the Center’s newly employed staff and technicians in radio telescope engineering through the conversion of an abandoned Vodafone satellite communication Earth station antenna into a radio astronomy telescope in the outskirts of Accra – the Ghana Radio Astronomy Project. Ongoing construction of the Ghana Space Science and Technology Institute on the Ghana Atomic Energy Commission’s Graduate School of Nuclear and Allied Science facility in Kwabenya, Accra (Credits: AFRICSIS). On January 1, 2013, the interim Committee implemented the second phase of the Plan by upgrading the Center to the Ghana Space Science and Technology Institute and securing its funding through the national budget. Notably, the Institute became the sixth institute of the Ghana Atomic Energy Commission. With its full organizational and administrative structure and directed by a Ghanaian space scientist, Dr. Prosper Ashilevi, the Institute will inter alia start a multidisciplinary graduate program in aerospace science and space technology in late 2014. Consistent with the Plan’s outlines for phase two, the Institute’s activities will also focus on developing and implementing relevant projects to achieve specific objectives. In the meantime and pending the establishment of the Ghana Space Agency, the Institute will coordinate and lead space activities and programs in Ghana. The Institute, like the Center, is co-located at the Commission’s Graduate School of Nuclear and Allied Sciences. Unlike the Center, the Institute will operate in a new two-storey building on the corner of the Commission’s School facility. The building is an undergoing construction, about 70% complete, and it will be ready for use in early 2014 with the graduate program scheduled to start later that year. 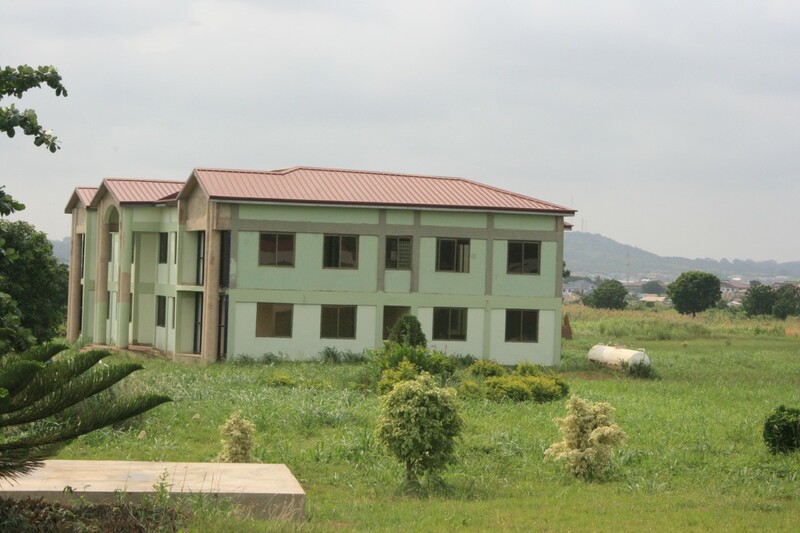 The building construction is sponsored by the national government through the Ghana Education Trust Fund. The building will provide space for different needs and services of the Institute including laboratories, administration, and teaching. The third and final phase of the Ghana’s space program development plan is scheduled for 2016 when the Institute will be elevated to the Ghana Space Agency. Looking forward, the Agency will coordinate government investment in space programs, including the procurement of telecommunication and Earth observation satellites. The ultimate goal of the Agency will involve enabling natural resources to be utilized in meeting the country’s socioeconomic requirements. It will also involve deriving greater value from space science, technology and engineering for the benefits of the Ghanaian society. It tends to be the case that emerging space nations always aim to maximize the economic and social benefits of their nation’s space program. In support of this, the Agency will naturally choose the development of domestic satellite communications and/or Earth observation capabilities as a starting point to impact and benefit the Ghanaian society. In fact, satellite communication represents the commercialization of space because every dollar – or Ghana Credi – of public funding invested in satellite communication technology generates a corresponding hundredfold return downstream . For Ghana, investment in domestic satellite communication system will aim at achieving increasing communication ranges and capacities at lower and affordable costs. In conclusion, the development plan of the Ghana space program outlines three phases of establishing a Ghana Space Agency that will develop a national space program and coordinate existing space activities. The three phases are the creation of Ghana Space Science and Technology Center in January 1, 2011, its upgrade to Ghana Space Science and Technology Institute in January 1, 2013, and finally the Institute’s elevation to the Ghana Space Agency in 2016. Thereafter, the government and Agency’s research, development, and operation investment in the aerospace systems and technologies including the procurement of satellite communications and Earth Observation satellites will have a large impact on the socioeconomic transformation of Ghana and the region. Ghana’s space program development plan was formed in recognition of the rising importance of private-sector individuals and organizations that invest their own time and money in space activities, particularly telecommunication and Earth observation services. This emerging space community is increasingly a major force in Ghana’s space development and is a key component of the nation’s envisaged accelerated development and economic transformation in the medium term. The creation of a centralized agency to manage the space program helps to clarify responsibilities and provides leadership to the developing space industry. For more about Ghana’s space plans, read the feature article in the Fall 2013 issue of Space Safety Magazine, available here.